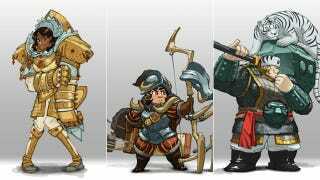 Let's Have More Lady Knight Designs Like These! Looking for a bit more variety in your female armor designs? One artist has created a web toy that offers prompts for drawing lady knights and shares some of his own designs. Head over to Ng's Tumblr to see more of his lady knight designs and to play with the randomizer—see if it inspires a few lady (or non-lady) knight illustrations of your own.